Smith was a self-taught genius who was the first to decipher a multitude of ancient Assyrian tablets. Today he would be vilified as a quack, a creationist, a non-expert, and someone unworthy of attention. He proved beyond any reasonable doubt that the flood of Genesis was no Babylonian inspired myth. Babylonian and Mesopotamian sagas were written of course long after Genesis. The passage above is also interesting since it denotes the pagan antecedents of Islam. The two principal urban cities of ancient Mesopotamia in the late 4th and 3rd millennium BC were named Ur and Uruk. Abraham the father of monotheism is thought to have migrated out of Ur to the Holy Land. The various ancient empires which emanated from modern Iraq worshipped the moon as the primary cosmological god. This is also true of the pagan Arabs, who would have created their own pantheon of polytheistic cosmology, with the moon – the giver of water, seasons, cool temperatures and relief – primary over the Sun goddess, who was oftentimes depicted as a consort of the moon. The worship of the moon and its various phases is a well-known historical fact. Hub'Al or Hub Allah, or Hu' Baal, is simply the moon god of Mecca. Baal was another name of the Babylonian moon deity Sin. Baal is often mentioned in the Bible and is linked to evil, including sexual depravity, child sacrifice, bull-worship, polygamy and tyranny. 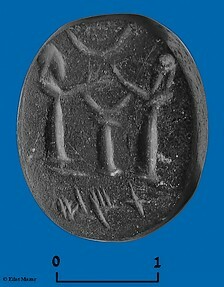 The above seal is an artifact from the Jewish exilic period of post 588 BC in Babylon. There is a crescent moon at the top of the Babylonian seal, above an altar to the the moon deity Sin. Mesopotamian empires dominated the Middle East for 2500 years and their pantheon was a major influence in the development of Arab theology. For example, Assyria, the precursor to Babylon dominated the Near East and Arabia for 1000 years. The Mesopotamian influence of some 2000 years would have been profound and final, upon the pagan Arabs squatting in the desert wastes of their peninsula. History confirms the linkages between the Babylonian Sin and the ancient Arab high God at Mecca named 'al Llah' or the 'most high'. Al-Lah in its shortened form means the High Lord, a euphemism for the high god, or the Lord on high, namely the most powerful god of the gods. In ancient coinage the star and crescent moon of Islam is rendered in the money of the ancient Arab city of Harran and the Sabean worship and art work equating Sin with the evening Star [Venus] named Ishtar by the Babylonians was commonplace. Ishtar was viewed as a goddess of fertility and love. Thus the main elements of the Mesopotamian pantheon were prevalent and dominant within its de-facto satellite tribes in the Arab peninsula.